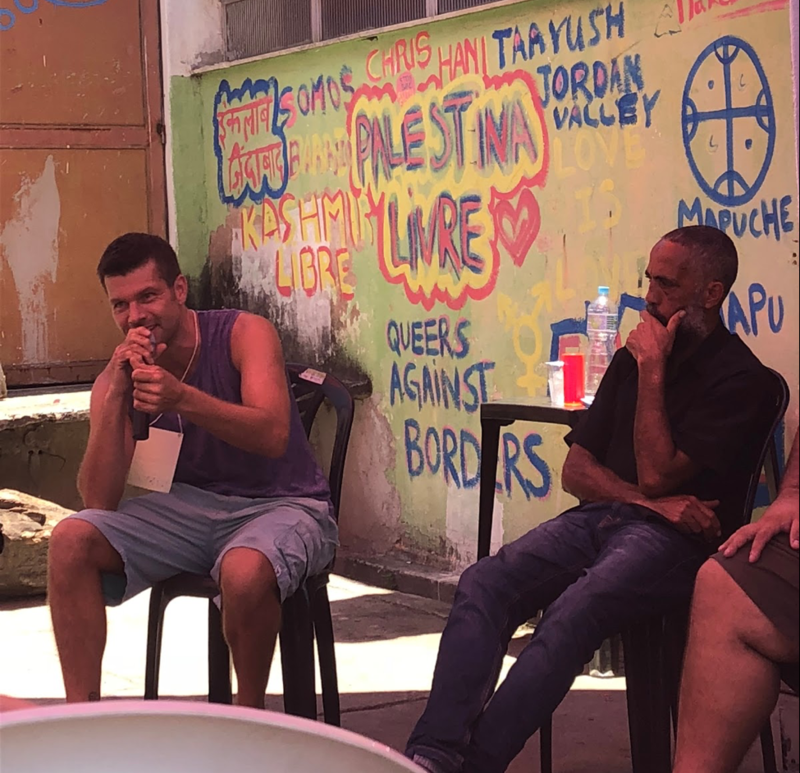 At an event held from December 9-15 at the Maré Museum and at the Center for Studies and Solidarity Actions of Maré (CEASM), the meaning of food sovereignty was discussed with a focus on peripheries. Food sovereignty is the right of people to participate in creating policies and making decisions about ways to produce food and is a fundamental component of any food and nutrition security policy. 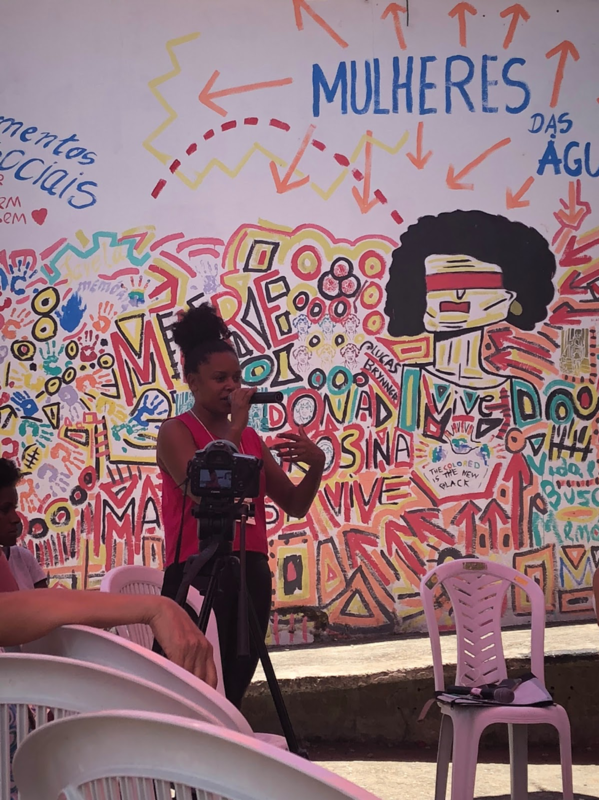 Thus, speakers commented on experiences and paths already taken in this direction through community initiatives in several of Rio de Janeiro’s favelas, with discussions mediated by Timo Bartholl of Coletivo Roça (“Farm Collective”). 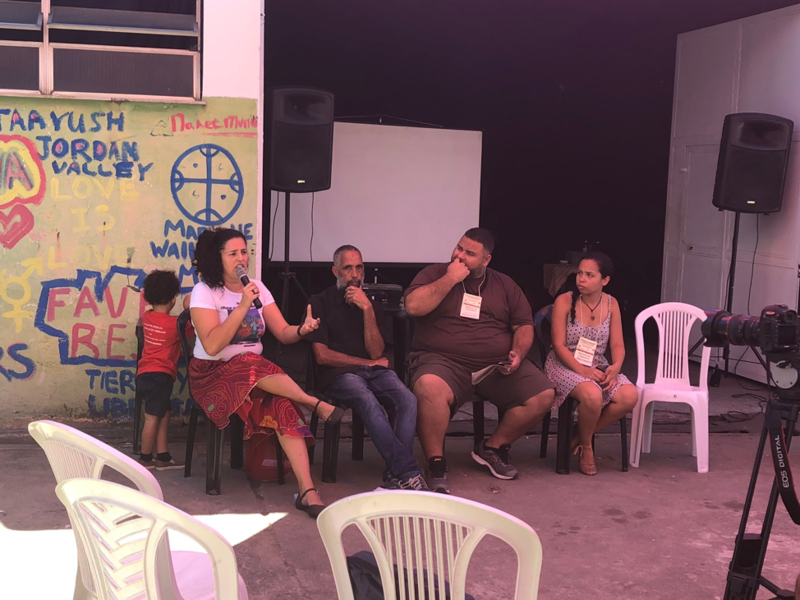 Outside activities were hosted at several points throughout the program in the garden of the Maré Ecological Park and at the Live Agroecology and Permaculture Laboratory (LaVAPer) at the Federal University of Rio de Janeiro (UFRJ) on Ilha do Fundão. One of the roundtable discussions at the event addressed “Agroecological Challenges in Urban Peripheries: Practices and Perspectives,” mediated by Naldinho Lourenço and with experiential accounts from Marcelle Felippe, a representative of Verdejar and the Agroecological Alliance of Rio de Janeiro (AARJ); Paulo Mesquita of Quilombo Cafundá Astrogilda, located in the Pedra Branca State Park; and Alessandra de Lima of the Gardening Research Group at the Urban Earthworms Collective. Another point is the need to value local knowledge in building food sovereignty, as this goes hand in hand with community self-management in deciding which foods will be planted, how the soil will be prepared and cared for, and how organic waste will be reused. 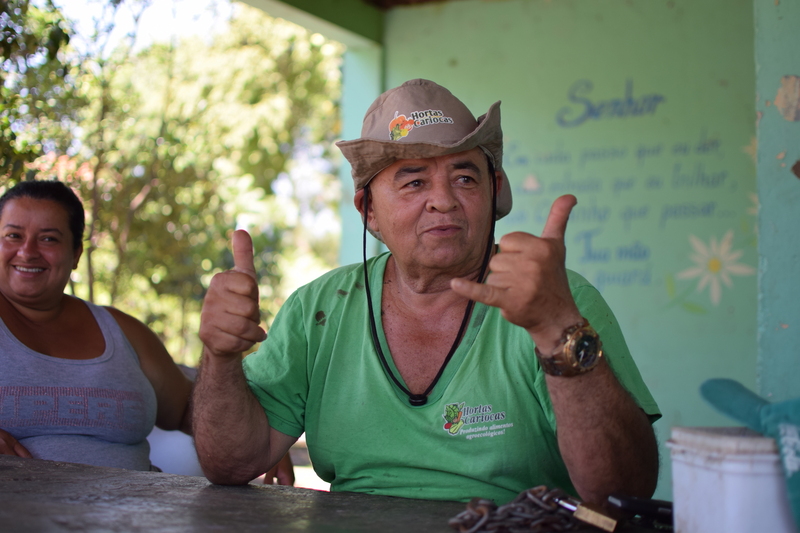 According to Felippe, the Rio Urban Agriculture Network has greatly strengthened the actions of collectives—recognizing small farmers’ initiatives, providing safety by certifying the organic foods that they produce, and enabling residents to have another source of income. Panelist Paulo Mesquita spoke about the need to revive old practices and concepts of soil use that are focused on preserving land and that were the foundation of nutritional sustenance. In this sense, agroecological activities are conducted in the gardens of Quilombo Cafundá Astrogilda in partnership with schools, integrating history and memory in the creation of these practices and teaching other ways of relating to the land. Some of the difficulties that Verdejar has faced include the violent confrontations in the region that have interrupted project activities over the past two years, issues of basic sanitation and water supply in the communities, and the involvement of young people in activities. Paulo Mesquita drew attention to the issue of conservation and quilombola land rights, which are constantly a target in disputes with public authorities. Outside activities included a visit to the Pinheiro Garden at the Maré Ecological Park, located in a landfilled plot (formerly Macacos Island). “When I respect nature, I respect life, and so I will reap good things…” reads a quote from Helder Marcus exhibited on a park wall. In this spirit, the community has organized itself to conserve and cultivate the only green space in Complexo da Maré. Through the implementation of the Hortas Cariocas (“Rio Gardens”) project by city government, the Ecological Park was renovated in 2002 to create a vegetable garden. Its function is to foster the cultivation of organic food, increase access to healthy food, and generate income in the favela. 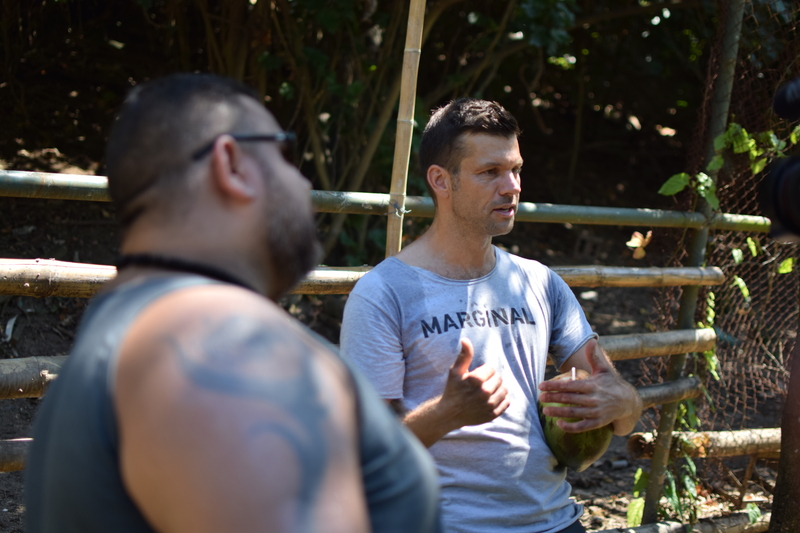 Thanks to the efforts of Mr. Bolado—the garden’s supervisor of fourteen years—the space has supplied produce including acerola cherries, mangoes, eggplant, and cassava. But this only accounts for half of the garden. The other half is being renovated and cared for by several groups in Maré through collective action projects but still faces huge obstacles to achieving sustainability. Firstly, the collective action projects are not enough to handle the maintenance of the space. City Hall needs to hire another supervisor like Mr. Bolado to take care of the other part of the garden. Secondly, the garden lacks the infrastructure to maintain itself. It does not have a hose long enough to reach the entire space and it needs an effective containment system to prevent animals like horses and pigs from getting in. Additionally, the soil provided by City Hall contains large quantities of broken glass, making it difficult to work and making it impossible for children to participate in the actions. 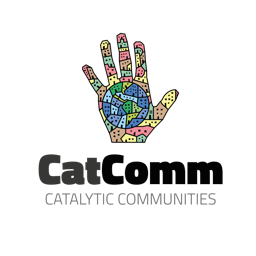 Even so, several community groups have already contributed and have used the space. This part of the garden has produced roselle (a medicinal plant), basil, mint, rosemary, pink peppercorns, and sunflowers. Coletivo Roça used part of this harvest to brew artisanal beers. The Muda Maré group also built a composter on site and has plans to build a dry toilet. All that is missing is additional financial support for the garden to flourish and increase its impact in Maré. This article was written by Jorge Sanchez Garcia, Renata Queiroz Ramos, and published on January 23, 2019.